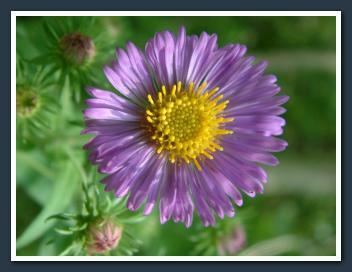 Western NY Wildflowers - This is a large and growing album of Wildflowers, Tree Blossoms, Vines, Ferns, Weeds and other plants of interest I encounter with my hiking throughout Western NY. This Gallery is located in my Picasa Web Albums site. I will continually add to this album as I take new pictures. Western NY Wildlife - This is a small but growing album of Birds, Bugs, Spiders, Snakes, and other animals I encounter with my hiking throughout Western NY. Franklin Gulf Conservation Park - Formerly known as Larkin Woods, Franklin Gulf Park is a 637-acre, Erie County-owned, undeveloped park in the Towns of Eden and North Collins. It is primarily a wooded area that has impressive topography and scenic natural features, such as creeks, ravines, waterfalls and ledge outcroppings. The topography is dominated by the "gulf," a steep gorge which is practically inaccessible. 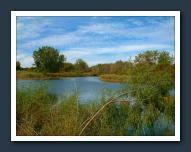 Cabic Pond - Cabic pond is located in the towns of New Albion & Persia in Western NY, about 25 minutes from my house. This area was developed by the Federated Sportsman's Clubs of Cattaraugus County and the Cattaraugus County Legislature. It is open to the public for fishing and is stocked with nice size large mouth bass. This photo album contains some photographs from two trips I took here with my wife. One trip in the summer of 2007 & the other in the fall of 2007. Enjoy the nice scenery! 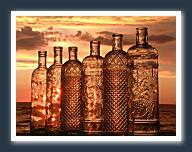 Bottles On The Sunset - Pictures taken at Evangola State Park in Brant New York, clear bottles turning orange with the glow of a beautiful sunset over Lake Erie. Winter Drive To Work - Since we have such a bad rap about our winters here in Western NY, thought I would show the world a typical drive to work from Brant, NY to Eden, NY. A six mile trip on two state roads. So what if we have a few whiteouts and couple of piles of snow over twelve feet high. Winter Scenery - Some winter scenery from right around my home here in Brant, New York. The sun was out and ice was on some trees, perfect timing! Some other shots from the backyard. Just Watching Some Birds on Christmas Day out the East Window.